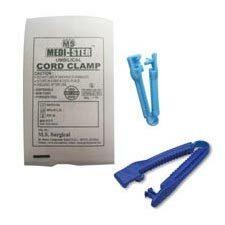 Backed by the team of experienced professionals, we are manufacturing, supplying high qualityÂ of Medi Ster Umbilical Cord Clamp. Umbilical Cord Clamp is made using medical grade plastic material and it is completely sterilized, thus it is safe to use. Umbilical Cord Clamp is available with multipurpose security lock and provides protection against accidental re openings. Umbilical Cord Clamp is available in different colors and sizes, catering diverse demands of the clients.